Approximately one third of all the properties we feature on our website are what we term luxury ski chalets. Needless to say that 'luxury' is a word which is bandied around travel industry descriptions with gay (even reckless) abandon. Sometimes it seems that even very ordinary chalets are described as being luxurious, or at least as having luxury features, which makes it very hard for clients to pick out ski chalets that truly do offer a luxury holiday. Price is a good indicator of luxury but it is by no means a fail-safe measure by which to yardstick one chalet against another. For example season rental prices in the premier ski resorts of the Alps force holiday companies to offer very average properties with ordinary in-chalet service at a high price. In these cases a high price doesn't mean that the chalet is luxurious. It simply means that the high demand for the top tier resorts allows a high price to be charged. In fact a true luxury chalet in a lesser known ski resort might well be significantly cheaper than a very ordinary property in a top league ski resort. 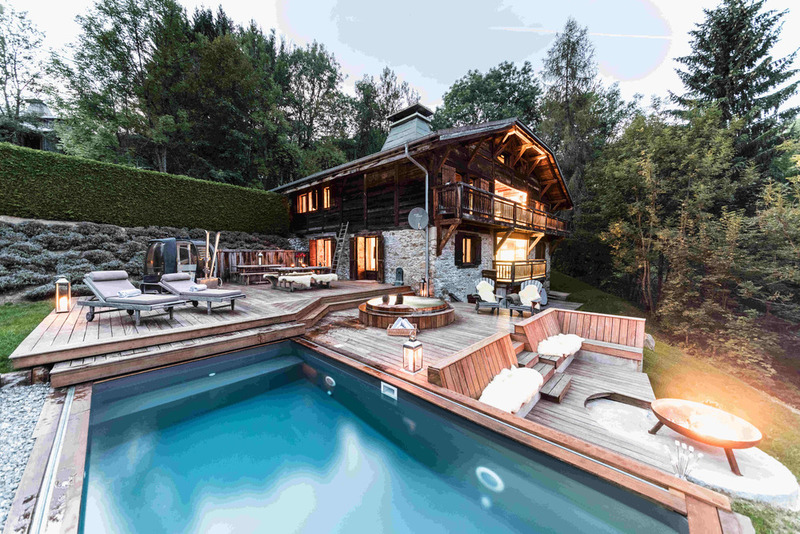 Chalet Endymion in Veysonnaz, Switzerland, is a prime example of this anomaly – a five star luxury chalet at very reasonable prices. Although Veysonnaz is not a household name among ski resorts it links easily into the very famous 4 Valleys ski area of Verbier which makes Chalet Endymion a fantastic value luxury ski chalet. We have been selling catered and self-catered chalets in the Alps since 1992 and know the intricacies of the ski chalet market a lot better than most. We have 400 chalet properties that we consider offer clients a true luxury ski holiday experience. However, true luxury is subjective and even coming from us experts there are different ways to judge it. For a property to be labelled as a luxury ski chalet the actual fabric of the building is obviously important. A large foot print allows a property developer to build a property with more floor space. Apart from physically being able to fit in the extra luxury facilities such as a separate spa and cinema room (see more about these below) they can also build libraries and separate dining rooms. A larger chalet will also offer the comfort of more personal space per guest - bigger bedrooms with greater amounts of hanging space, larger bathrooms with double basins, sitting room areas which can accommodate more sofas, large terrace areas with outdoor seating. Simply, more room in which to live. Size therefore matters when it comes to creating luxury ski chalets. However, size is not necessarily everything. We would argue that really top notch in-chalet service from resort staff offering genuinely high levels of cooking and a professional approach to hospitality actually out-scores a holiday based in a large chalet offering only mediocre in-chalet service. Although the chalet itself is important there is more to a luxury ski chalet than simply the bricks and mortar. There are plenty of chalet holiday companies which offer a truly luxurious ski holiday by virtue of their excellent in-resort service. Their chalets are quite often rated as only 4 star (comfortable) properties but we elevate these to luxury status based on the quality of cuisine and the professional, efficient, polite and well-trained staff. These usually smaller ‘owner managed’ companies are driven from the top down by highly motivated managers who are often based in resort, on hand to maintain standards from the first week of the season through to the last. The owners and directors of the small high quality chalet companies which major on service broadly speaking fall into one of two camps. 1) Coming from (previous) financially successful working backgrounds such as banking, property development, industry or the law these people have a clear understanding of what quality service is all about. In their former lives, before deciding to run a ski chalet company, these professionals would have experienced high quality hotel service, eaten in plenty of Michelin starred restaurants and enjoyed professional hospitality at its best. They take their experience and knowledge of luxury service to replicate the highest standards for their chalet guests. Chalet Trois Ours in Meribel owned by Avery Crest is an example of this. The San Lorenzo Mountain Lodge and Baita 1697, both in Italy, also fit this mold. Hip Hideouts in Val d’Isere is another example of a chalet company offering first rate in-resort service. 2) Other companies have been long time established in the Alps and are run by people who simply love the mountain life. Their passion for the Alps, skiing and mountain living heavily influences their in-resort service which has been honed over the decades to provide a luxurious holiday experience. Ski Cuisine and Meriski, both based in Meribel, France, are examples of how a luxury chalet holiday can be created not so much from the fabric of their chalets but rather from top quality in-chalet service which has been refined over many years. 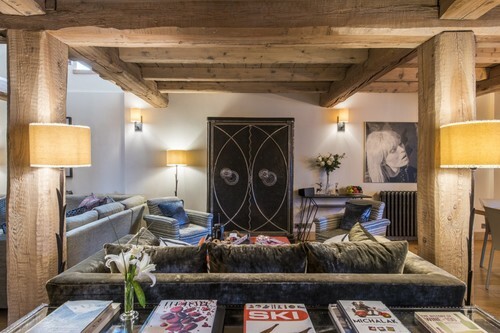 YSE in Val d’Isere is another prime example of a chalet holiday company offering luxury ski holidays as a result of dependable and good quality in-resort service. On the face of it chalet cooking in one property will appear indistinguishable from another. Both may offer cooked breakfasts, afternoon tea and 4 course dinners with complimentary wine. However, one will offer a genuine haute cuisine experience whereas the other might serve up the burnt (or under-cooked) offerings of a less than interested gap year student who struggles to boil and egg let alone puree a cauliflower. Chalet companies may go to lengths detailing on their websites a typical weekly dinner menu. The trouble is that anyone can make a menu sound mouth-watering but only some can in reality, deliver. We know which chalet companies offer the best chalet cooking. And just as good in-resort service can elevate a holiday to a luxury level we believe that top quality performance from the kitchen counts just as highly. Holiday companies such as Ski Cuisine, Powder n Shine, The Alpine Club, The Tasty Ski Company, Chalet APASSION, Alpine Escape, Purple Ski and Meriski all punch well above their weight as a result of top quality chalet cuisine. Read more about chalet cooking. There was a time when simply adding a hot tub to the outdoor deck or terrace was enough to turn your ski chalet into a luxury ski chalet. However, as with most things in life standards rise as a result of increased competition and customer demands. Today a proper luxury ski chalet will often include a separate dedicated cinema room; a spa area in the basement or a usable outdoor area. Although a separate TV snug or corner area is desirable it’s hard to deny the pleasure of watching a feature film in a dedicated cinema room. Fabric lined walls offer superb acoustics; tiered seating gives everyone a comfortable view; Dolby sound systems, lighting systems and large screens offer the true cinema experience, and an almost limitless supply of titles through Netflix, Apple TV or Sky keeps everyone happy. Chalet Black Pearl in Courchevel 1850 offers pretty much the best of everything but we really love its cinema room. Developed basement areas make the perfect space for a sauna, steam room, massage/treatment room, gym, showers and relax area (plus if space will allow and indoor swimming pool). Certain luxury ski chalets with dedicated spa and wellness areas will rival any 5 star hotel for the quality of the facilities on offer, and no hotel can match the privacy of your very own wellness area. The spa at Chalet Zermatt Peak takes a lot of beating but there are plenty of other luxury ski chalets to choose from with similar wellness credentials. 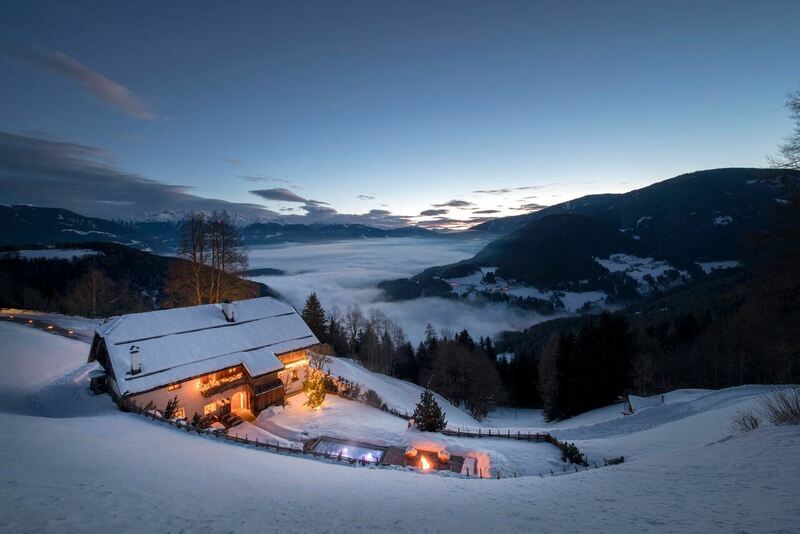 Luxury ski chalets are often set in their own private grounds and sometimes they offer fabulous mountain views. What better way to admire these views than from the comfort of a dedicated outdoor area? Often an extended terrace, accessed from the main sitting room, offers comfy outdoor seating, fire pit, hot tub (or glass fronted sauna). These large usable spaces really come into their own during the warmer months of March and April when the afternoon sun is strong enough to allow guests to sit out and enjoy the majesty of the their surroundings. Few luxury ski chalets can match the outdoor space offered by one of the original Grand Design properties, Ferme de Moudon in Les Gets, France. Chalet Mont Tremblant in Meribel should also be mentioned. So often we have clients asking us for chalet properties that offer ski in ski out access. Whereas it is perfectly understandable that these chalets are desirable, after all who likes carrying their skis and walking in ski boots, there are plenty of chalets that offer an excellent driver service. Having a driver and minivan at your beck and call throughout the day is in many ways more convenient than having a ski in ski out location. With a driver you can elect to start and/or finish your ski day at different locations, this is very much an advantage in a large ski area with several main lift stations and lots of different ways down off the mountain. Beat the queues in Morzine by accessing the main lifts at Ardent or Nyon and on a powder day be the first up the Le Fornet cable car in Val d’Isere. Apart from offering a smiley face and some charm your driver (usually a very keen skier themselves) can also give you advice on where best to ski for the day depending on the prevailing snow conditions. Luxury ski chalets with very good driver service include those operated by Freedom Ski in Morzine, Chalet Narnia in St Anton, Austria, and the Ferme du Lac Vert in the Portes du Soleil ski area.